What is the one learning theory that I feel all teachers should be made aware of? Cognitive Load Theory (CLT) – Coined in 1988 by John Sweller, this theory posits that our working memory is only able to hold a small amount of information at any one time and that instructional methods should avoid overloading it in order to maximise learning (Sweller, 1988). Why have I chosen this theory? We’ve all been in learning sessions where the teacher has whizzed through the content, leaving us with little to remember. We’ve also been in those sessions where the content is so complex that we leave more confused than when we entered. CLT goes some way to explaining why this happens and what we, as teachers, can do to maximise the learning of individuals within our classrooms. Building on the work of Baddeley and Hitch (1974), CLT views human cognitive architecture as the working memory and long term memory. Put simply, the working memory has a limited capacity and consists of multiple components that are responsible for directing attention and coordinating cognitive processes. Long term memory on the other hand, has an endless capacity for storage and works with working memory to retrieve information (Baddeley, 2003). What can teachers do to reduce cognitive load? Activate prior knowledge before sharing new information with students – Our long term memory is said to have a number of organised patterns of knowledge (known as schema). Each schema acts as a single item in working memory, so can be handled easier than having lots of new, isolated information. Through retrieving information from the long term memory via quizzes, visual aids and discussions, students can bring crucial information to working memory (see image 1) and assimilate new information to build upon what they already know (Baddeley, 2003). Activating prior knowledge is also supported in the work of Marzano, Gaddy and Dean (2000), who found a substantial improvement in achievement (0.59ES). Furthermore, retrieval practice has shown to strengthen our retention of the information (Wenger, Thompson and Bartling, 1980) – a win win! Use visual and verbal information to present information to students – This has nothing to do with the infamous ‘learning styles’, rather empirical research suggests that our working memory has two points of entry (Chandler and Sweller, 1992). One accepts auditory information, whilst the other visual. If the auditory and visual information correspond to one another, then the burden on working memory is far less than using one pathway alone. 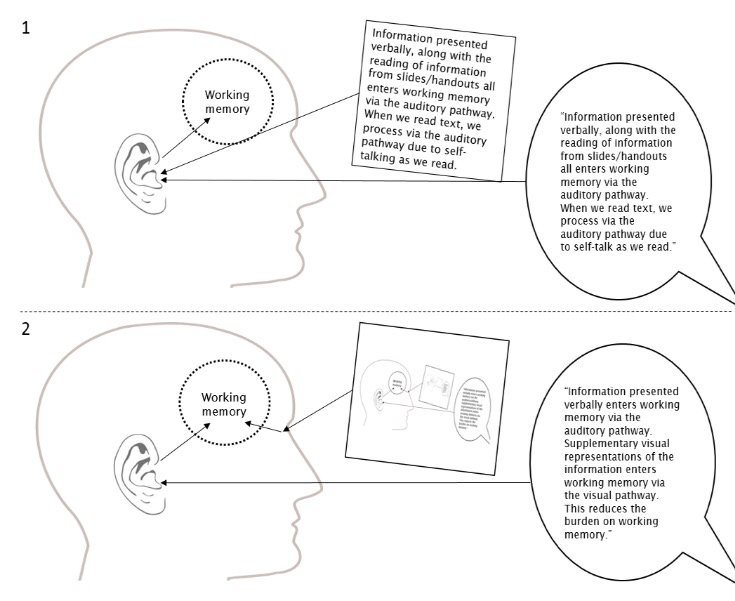 Image 1 shows the effect of using one pathway to working memory, whereas image 2 shows the use of both. However, please note that if the text and visual information are not clearly integrated, then it could have adverse effects on learning (Chandler and Sweller, 1992). Use worked examples and models to support learning – There are a wealth of studies that have shown the positive impact of using worked examples to enhance learning (Chandler and Sweller, 1991). According to Clark, Nguyen and Sweller (2006, p.190), ‘a worked example is a step-by-step demonstration of how to perform a task or how to solve a problem’. These steps provide learners with direction and support to create mental models of how to tackle a problem/task, or what ‘good’ looks like. Discovery or problem-based learning on the other hand can be burdensome to working memory due to learners having insufficient prior knowledge to draw upon to support their learning. Moreover, the vast amount of information they have to consider in completing work independently can result in a struggle to direct their attention. As learners develop a greater understanding of the topic, elements of the worked or modelled examples can be ‘faded’ (removed) to foster greater independence. In summary, regardless of one’s philosophical predisposition, I argue that all teachers need to have an awareness of the potential benefits and limitations of the ways in which they present learning opportunities for learners. CLT and the associated empirical research provides us with an understanding of how we process, organise and store information most effectively and for this reason, all teachers should acquire a basic understanding of the premise. Baddeley, A.D. (2003). 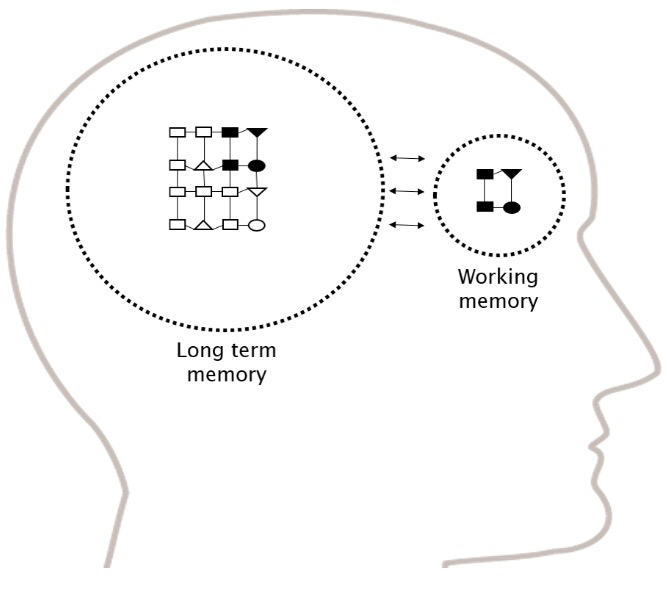 Working memory: looking back and looking forward. Nature Reviews Neuroscience, 4, p.829-839. Baddeley, A.D. and Hitch, G. (1974). Working Memory. Psychology of Learning and Motivation, 8, p.47-89. Chandler, P. and Sweller, J. (1991). Cognitive Load Theory and the Format of Instruction. Cognition and Instruction, 8 (4), p. 293-332. Chandler, P. and Sweller, J. (1992). The split-attention effect as a factor in the design of instruction. British Journal of Educational Psychology, 62 (2), p.233–246. Clark, R.C., Nguyen, F. and Sweller, J. (2006). Efficiency in learning: evidence-based guidelines to manage cognitive load. San Francisco: Pfeiffer. Marzano, R.J., Gaddy, B.B. and Dean, C. (2000). What works in classroom instruction. Aurora, CO: Mid-continent Research for Education and Learning. Sweller, J. (1988). Cognitive Load during Problem Solving: Effects on Learning. Cognitive Science, 12, p.257-285. Wenger, S.K., Thompson, P. and Bartling, C.A. (1980). Recall facilitates subsequent recognition. Journal of Experimental Psychology: Human Learning and Memory, 6 (2), p.135-144. Really like your posts!. May we use links to them as part of a learning module set (free) for healthcare staff?. We have thousands of staff across healthcare (home is Barts Health and QMUL) using our eCPD app as part of their ‘in the moment’ learning. We create app based learning modules from great content such as your posts, add MCQs (we do this) and our staff get CPD credits for their educational revalidation portfolio. You get full author credit for the material, and we just link to the site, not downloading/uploading anything. Would be fab, and bring your stuff to a new audience! Absolutely fine by me, Jo. I found my way to your post via a few links from friends. I think you might be interested in an application of CLT I have described for a form of literacy instruction called “structured word inquiry”. Some background. I was a classroom teacher for 10 years before I did my doctorate in a Faculty of Education where I studied an literacy instruction approach that I encountered in my 9th year in the classroom that I have since described as “structured word inquiry (Bowers & Kirby, 2010). The basic idea is that it turns out linguists have long understood that English spelling is a highly ordered system for representing the meaning of words for those who know and speak the language. Unfortunately, teachers are falsely trained to think of it as primarily a sound based system full of exceptions. This leads to teaching in such a way that presents the written word as confusing with tons of spellings that have to be memorized. Among other things, this creates a ton of unnecessary extraneous load. So we have to remember that the word “sign” has a ‘g’ there randomly, rather than investigating this word and its relatives like “signal” “signature” “design” “assignment” and many others that are connected in meaning and structure. Like linguists, teachers and students working with SWI use word sums as what I would call “worked examples” of the underlying structure of such words (sign + al –> signal; de + sign –> design; sign + ate/ + ure –> signature). In this way we can study and understand the presence of the “g’ in “sign”. And this is a way to learn what linguists like Carol Chomsky (1970) have long told us — that morphemes (bases and affixes) do not even have a pronunciation until they are in a word. Similarly, the spelling “does” is completely coherent with the structure do + es –> does which parallels go + es –> goes. In English the spelling of morphemes is consistent to mark meaningful connections even with pronunciation shifts. During my graduate work I was introduced to Cognitive Load Theory and instantly saw the importance for any teaching. I also saw so much of what I was studying about SWI was perfectly in line with the suggestions of SWI. Illustrations and videos of this instruction are available at my website http://www.wordworkskingston.com. Pingback: Learning my Craft pt 1.